1989–1991 On the Television Various Episode: "Beauty and the Beast"
1995–1996 Ned and Stacey Jeanne Episode: "Loganberry's Run" and "Accountus Interruptus"
1996–1998 Seinfeld Sally Weaver Episode: "The Cartoon" and "The Doll"
↑ Nededog, Jethro (July 13, 2011). "'Same Name': Kathy Griffin, Mike Tyson and Reggie Bush Accept CBS' 'Freaky Friday' Challenge". The Hollywood Reporter (Lynne Segall). Retrieved January 4, 2012. ↑ Gallo, Marissa (October 26, 2011). "America's Next Top Model" create fragrances, pose as reality TV stars. baltimoresun.com. ↑ Kathy Griffin' brings 'D-List' mentality to Cleveland. news-herald.com (October 20, 2011). ↑ Kathy Griffin Named New Host of E! 's Fashion Police on Fashion Police - E! News UK. 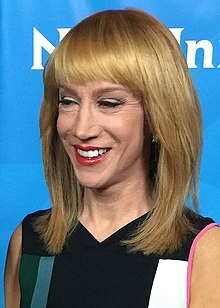 اینگیلیسجه ویکی‌پدیاسی‌نین ایشلدنلری طرفیندن یارانمیش«Kathy Griffin»، مقاله‌سیندن گؤتورولوبدور. ( ۲۱ دسامبر ۲۰۱۷ تاریخینده یوْخلانیلیبدیر). قارداش پروژه‌لرده کتی قریفین گؤره داها آرتیق بیلگی‌لر تاپابیلرسینیز.